2017 Outstanding Student Life Award winners with Larry Lunsford, vice president for Student Affairs. On Thursday, April 6, more than 40 finalists competed for 15 awards, varying from service and spirit to leadership and diversity at the Outstanding Student Life Awards. The award ceremony recognizes students who have excelled academically and in the areas of service, citizenship, innovation and promotion of the Panther spirit. Created and sponsored by the Division of Student Affairs, there’s no other award ceremony that honors students from every academic year and college. Luis Valderrama is truly committed to impacting FIU students and his community through continuous service. Throughout his time at FIU, he coordinated a full week of volunteer opportunities during the holiday season to provide community service in Orlando. His work benefited at-risk families and organizations that provide emergency housing, including Orlando Union, the Salvation Army of Central Florida, Clean the World and United Against Poverty. Valderrama also volunteers feeding the homeless, to ensure every person can have a meal at the end of the day. True service is the desire to give back to the community without expecting anything in return. Chi Sigma Iota Counseling Honor Society epitomizes that role by raising money, collecting donations, creating awareness and participating in service events. Chi Sigma Iota Counseling Honor Society endeavors to create future generations of professionals and counselors who will serve those in need. Described as demonstrating a can-do attitude with a team player mentality, senior Cayla Bush has played a critical role as the editor-in-chief of our student newspaper, the Panther Press. Bush has been instrumental in developing a weekly magazine, the implementation of a new brand for all mediums of Student Media and coordinating a series of student forums to help understand student issues at FIU. The Modern Languages Graduate Student Organization hosts several events that prepare students academically and professionally. The students of the organization created a series of workshops with world-renowned speakers from various cultures, executing a Job Market Workshop as a networking opportunity, and encouraging members to present at local conferences. As founder of the student club Peer Mentors and Company, and serving as a resident assistant for Bayview Housing, Kaila Jospitre helps her fellow students during transition into FIU. She is described by her nominator as always having a positive attitude and looking forward to each day she interacts with new students. Amara Fazal has created opportunities for many students at FIU to be heard. In addition to serving as vice president of the American Medical Women’s Association, she is active in the White Coats Black Lives movement, the American Association of Physicians of Indian Origin and Medical Students Working to Improve Society and Health. With onlya first few months on campus under her belt, Mia Gabb stands out. She has been selected as a 2017 peer advisor, where she will have the opportunity to affect thousands of incoming students and their families through orientation. Ronan Kelly – described as ambitious, kind, humble, hard-working and always looking to help other students – has already been awarded Leader of the Month in Academy of Leaders. Alexandra Gutierrez eagerly began her engagement at FIU by attending Panther Camp, and was later selected to be a peer advisor and a peer mentor. She put her personal spin on course content, and asked if she could take the lead on multiple class assignments and discussions. Gutierrez gives back as a site leader for Alternative Breaks and within her sorority, Delta Phi Epsilon. Jaime Weiser is involved with the FIU Honors College, is a member of Alpha Omicron Pi, a resident assistant and a peer advisor. 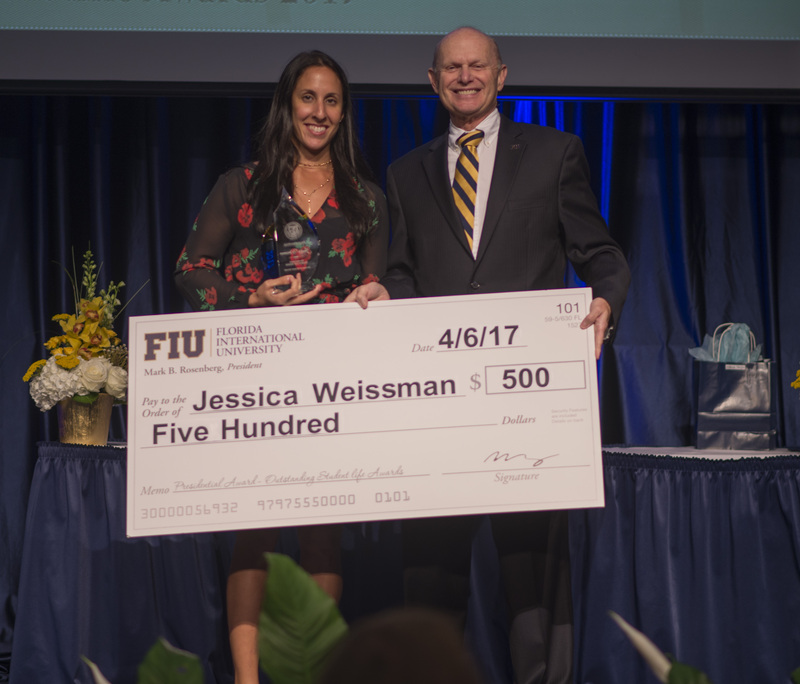 Weiser has made an impact on the FIU community mainly through her involvement, but also with her mindset being inclusive to all. Jaime Weiser (center), Sophomore Leadership Award recipient, with Cathy Akens (left), associate vice president for Student Affairs and Dean of Students, and Larry Lunsford (right) , vice president for Student Affairs. Serving the university as a resident assistant, an orientation peer advisor, a Panther Camp facilitator and as an executive board member of his fraternity, Anthony Bolcato is an exceptional role model for incoming FIU students. Bolcato has also served as one of the marketing chairs for Relay for Life, in order to further apply his leadership skills and passion for service and philanthropy. Bolcato is also currently completing an undergraduate fellow internship in student affairs and higher education, thereby making concrete plans to utilize his leadership skills and passion for helping college students in his future career. Emily Corbin is considered to be someone who does not lead from the top, but rather leads from behind, encouraging others to reach their greatest potential. In addition to her executive board positions in her sorority, Corbin has held leadership roles in Relay for Life, The Order of the Torch, and is currently the co-director of the Miss FIU Scholarship Pageant. Additionally, she has been an active member in a number of campus organizations over the last few years such as Omicron Delta Kappa Leadership Honor Society and the Order of Omega. She also served first as an intern, and later as a senator, in the Student Government Association. Corbin also serves as the student volunteer coordinator for the Brucie Ball Education Center. Emily Corbin (left), recipient of the Junior Leadership Award, with Shannonlee Rodriguez (right), program manager at the Center for Leadership and Service. Driven by his passion for social justice, public service, diplomacy and international development, Luc Pierre-Louis is involved with the United Way Campaign, SGA Finance Committee, and It’s on Us Sexual Assault Awareness Campaign. He has also conducted several student surveys to determine students’ food needs on campus. He founded a grassroots non-profit campus chapter of the RESULTS Educational Fund at FIU, which is committed to eradicating poverty and marginalization through legislative means. 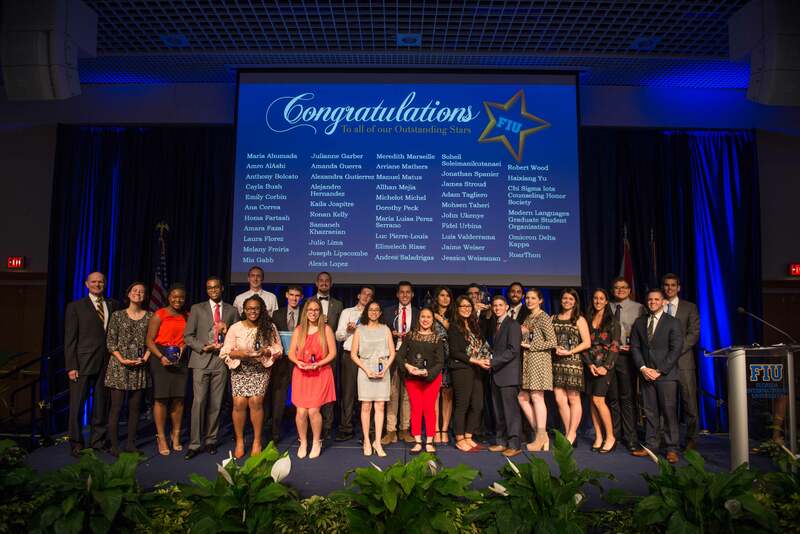 Finally, as a star member of the FIU Model UN team, recently ranked 2nd in the nation ahead of all Ivy League Colleges, Pierre-Louis earned a “Best Delegate” award at Boston University’s BarMUN Conference, and a Commendation at the University of Pennsylvania’s UPMUNC Conference this past fall semester. As director of planning for RoarThon, Fidel Urbina successfully executed the most successful year of organization in the past 19 years. Urbina currently serves as a Panther Camp facilitator and acts as the philanthropy chairman for his fraternity while positively impacting and encouraging his brothers to be an integral role in the FIU community. He has participated in many outside community events, including promoting an event for The Lodge, a domestic violence shelter in Miami, bringing peace to the inhabitants. Urbina constantly strives to develop his leadership skills by working with the Center for Leadership and Service’s Academy of Leaders. This past fall semester, Alexis Lopez developed a workshop for the Sisterhood Retreat, the annual women’s empowerment weekend program, in addition to her job responsibilities as a Resident Assistant, a student assistant in the Women’s Center, and a full-time student. She used well-researched information about women’s health and wellness, sexual health, and the way different cultures view these issues to create a game show to be played by the 40 participants at the retreat. In her nominator’s 11 years working with the Sisterhood Retreat, she stated, “it is considered the best workshop to date.” Lopez is a leader who has demonstrated her dedication to serving others and serving her university during her time here at FIU. Pursuing a bachelor’s in communications in the Honors College, Amanda Guerra is an exceptional student leader. Her passion for FIU began when she attended Panther Camp in 2013. As a freshman, she was selected as a Panther Camp facilitator. Guerra returned a second year, as the 2015 director of recruitment, focusing on freshmen recruitment. As a junior, she served as the 2016 executive director for Panther Camp, where she worked with 37 other student leaders and guided them through their process as a Panther Camp facilitator. 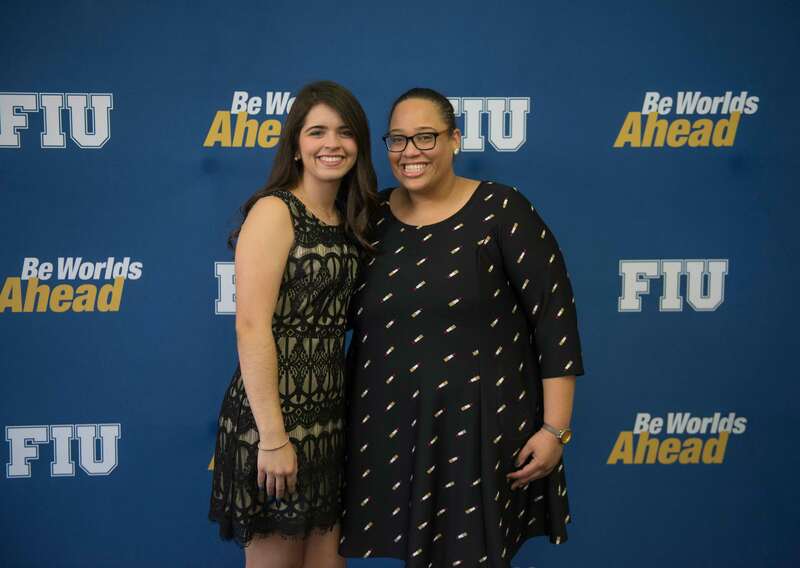 As a senior, Guerra has served as her sorority’s Sisterhood co-chair, an Alternative Break Site Leader with the Center for Leadership and Service, and was elected as FIU’s Order of the Torch President. Guerra is currently on the path to fulfilling her dream to work within the film media industry, and serves as the media intern for the Adrienne Arsht Performing Arts Center. Samaneh Khazaeian exhibits outstanding leadership and tireless efforts in addressing and raising awareness about the important role of women in transportation engineering. She was a founding member and president of the Women’s Transportation Seminar and has recently been recognized with the South Florida Chapter of WTS’s Leadership Legacy Award. She has participated in multiple research projects, including working with both the Florida and U.S. Departments of Transportation, and continues to be a top academic performer among her peers. As a fourth year medical student, Adam Tagliero has served in numerous capacities, including co-president of the American Medical Association chapter and the Dermatology Interest Group, elected to represent the College of Medicine within the Student Government Association. He has served as a student mentor for medical students and undergrad pre-med students. Tagliero has also made an effort to teach and train students to be culturally competent physicians. Amro AlAshi is an exemplary scholar, majoring in both biology and chemistry in the pre-med program with a near perfect GPA. He has participated in several coveted medically-related research programs, like the Miami Children’s Research Institute and the Knecht Group, and has represented FIU at 8 conferences through poster and oral presentations. In addition to his research, AlAshi has also found the time to volunteer for day long service projects to week long medical brigades, serves as a learning assistant, tutor, mentor, and in various capacities in medically related student organizations on-campus. He has been awarded the Dean’s Active Citizenship Award and the Dean’s Service Award from the Honor’s College, as well as the President’s Volunteer Service Award (Gold) from Nicklaus Children’s Hospital. Author of 16 scientific publications plus three in preparation, along with another 13 popular publications and natural history notes, James Stroud is described as being in the top one percent of all the graduate students. He has orally presented at 11 local, regional and national conferences; prepared 10 poster presentations for other conferences; and has received international media coverage 11 times. For the last several years, Stroud has led a team of international experts to develop a comprehensive series of projects using the recently introduced anolis lizard communities of South Florida as a model system to test the theories of ecological release, character displacement and adaptive radiation. Additionally, Stroud makes time to mentor undergraduate students and served as the graduate student advisor for FIU’s ecology club, GLADES, which was recognized in 2015 as the best student chapter in the nation under his guidance. He also worked with Fairchild Tropical Botanic Garden to develop the “Lizards on the Loose” program to educate local elementary students about the lizards they interact with in their schoolyards and backyards. Nursing student Joseph Lipscombe has completed tours of duty in Afghanistan, taking on such roles as military police and Special Forces medical sergeant. His leadership at FIU has also been impactful, serving as the mentorship chair of the Student Veterans of America student organization on campus. After completing his bachelor’s in nursing at FIU, Lipscombe plans to continue his education in the medical field with the goal of using his medical training and experience to embark on medical relief missions domestically and abroad. Chemistry major and biology minor Robert Wood plans to utilize his science knowledge and passion for serving others to attend medical school in 2018. While a student at FIU, he has served as both a learning assistant and a teaching assistant in the chemistry department for three years, providing support and education to his peers. Additionally, Wood has given chemistry presentations to underprivileged youth through the Upward Bound Program, and for middle and high school girls through the Geeki Girl Program. He has also served as a science fair judge at local middle and elementary schools, and has represented FIU students with the Bill and Melinda Gates Foundation, Department of Education and New Faculty Orientation. A leader, mentor and role model, Jessica Weissman is a doctoral candidate, researcher and scholar in Public Health, who is changing the world through her work in the Department of Health Promotion and Disease Prevention and beyond. Weissman has served as a leader in various capacities ranging from the classroom to her graduate research fellowship with the Center for Research on U.S. Latino HIV/AIDS and Drug Abuse. She designed an original survey research study and took the lead to turn the findings into a manuscript that was later published in the Florida Public Health Review. She also served as first author in the submission of abstracts to conferences, and was able to present the findings at three national conferences. Weissman has published nine journal articles, and presented at more than 15 regional, national and international conferences. Most recently, she took the lead in conducting an important systematic review which was accepted for publication in a highly regarded scientific journal, AIDS Education and Prevention. The purpose of this project was to assess HIV risk-reduction interventions among women of reproductive age throughout the world who abuse substances, so that evidence-based recommendations can be made for future intervention studies and for clinical practitioners who work with patients at risk for HIV infection and suffering from substance abuse disorders. Jessica Weissman, Presidential Award recipient, with Larry Lunsford, vice president for Student Affairs. Weissman represents FIU as a leader in state and national organizations, including serving on the board of directors for two years for the Florida Public Health Association. Her leadership was exemplified in 2016, when while enrolled in full-time graduate credit hours and writing her dissertation proposal, she became the chairperson of the Planning Committee for the 2016 Florida Public Health Association’s South Florida Regional Conference. Working with the Florida Department of Health, the Broward Regional Health Planning Council, and the Florida Surgeon General, she and her team planned an exceptional conference, earning her the Presidential Award and a Graduate Student Scholarship at the statewide annual conference later that year. 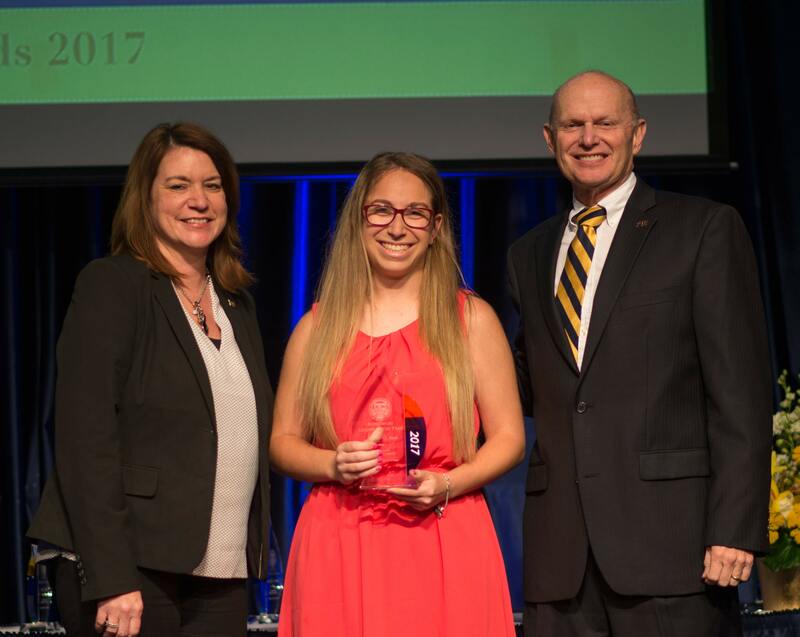 She has also served as the Campus Liaison between FIU and the American Public Health Association – Student Assembly, where she did such an exceptional job, she was awarded the Campus Liaison of the Year award and was asked to oversee the Campus Liaisons across two regions, which includes 10 states.